Bono used a pair of lightweight ski-mountaineering race skis up to 14,000 feet, but conditions were too dangerous to use them above that point. "I was trying to keep the risk margins pretty large for this trip—it would have been super embarrassing to have an accident doing something like this," she said. Bono noted in an email that "conditions weren't that great" during her ascent. "The lower glacier was super windy and then I had to break trail in a whiteout (legit whiteout) from 12,000 feet to 14,000 feet," she wrote. "Then I had to break trail across the Autobahn (17K to 18K) on the way up and on the way down because there was so much drifting snow. It was super cold above 18,200 feet—I got some frostbite on my nose and mouth. The lower glacier was in pretty bad condition because it had rained for three days the week before and the glacier was already in super bony conditions this year to begin with, but it was cold enough and I was light enough when I was on the lower glacier that the snow bridges felt relatively solid." Trying to keep up with Katie on days we moved camp was SO hard, photographer Savannah Cummins wrote in an email. Weather was extreme the entire time, it was either below freezing with crazy winds and snow, or extremely warm which meant people were walking around in their underwear or hiding in their tent from the rain. Denali sits 2,000 miles north of Everest and the climate and conditions are some of the harshest I've ever experienced. It's amazing Katie didn't give up; it just seemed like things weren't aligning for her to have a good attempt. The fact that she tried it one week and got so close—18,000 feet—and had to turn around, and she was still determined to sit in the rain for a week not knowing if there would even be another weather window. Katie endured a lot to make this speed ascent happen and obviously her ascent is impressive, but I think what it took to get there is what is really inspiring. Bono is a 29-year-old mountain guide living in Boulder, Colorado, who is currently applying for medical school. She set the women's speed record (4:58) on Mt. Rainier (14,411') in 2012 (the men's record with skis is 3:51). She's guided the West Buttress twice—in 2013 and 2014—summiting the mountain for her first time on her second trip. In 2015 she climbed Denali's Cassin Ridge (Alaska Grade 5, 5.8 WI 4). She said that's when she first got the idea to eventually try for a speed ascent. "It was a pretty obvious idea to try!" she said. By then she was "very familiar" with the topography. "All of those trips basically require climbing the mountain multiple times because of load ferrying and acclimatization runs," she said. Bono also became the first U.S. woman to send M13 when she completed The Lightning in Vail, Colorado, in 2015. She spent a total of 26 days on or at the base of Denali. "I wish I could have done other things," she said. 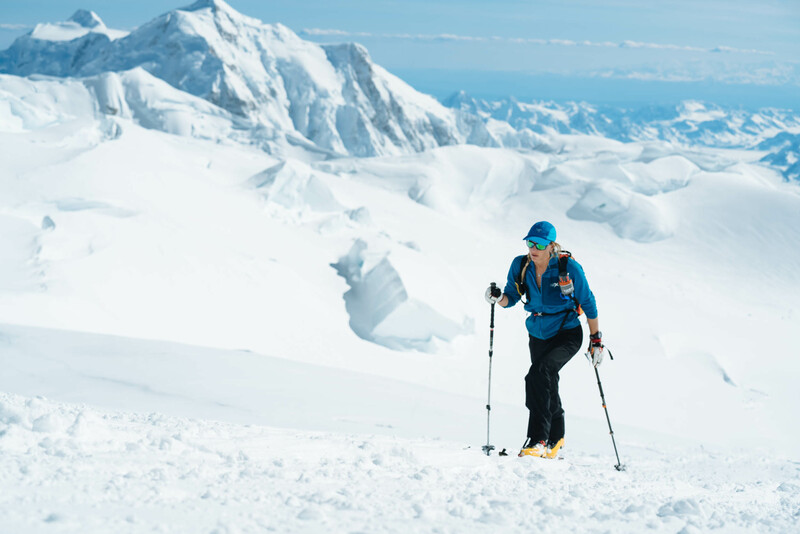 "I actually had plans to do some climbing on Foraker after the speed ascent (we had budgeted 28 days), but the weather was so bad this year that just this ascent took all I had. There were only three actual high-pressure days while we were up there, and they were too early in the trip for a summit day—the rest of the days were storm days or days where if you were tough and fit and also a bit lucky, you could maybe summit (maybe five to six days like this)." Her first 17 days there involved getting pinned down by a storm at 11,000 feet for several days and then performing an emergency evacuation for a friend who came down with appendicitis on the descent from the 14,000 camp on Days 16 and 17. "We had amazing luck and also an amazing team of rangers who helped us evac him, and he got out and had emergency surgery and he didn't die, which was incredibly lucky," Bono said. Day 18 was a rest day and she attempted an earlier speed ascent on Day 19. "The weather was OK and could have gone either way, but a cap descended on the mountain when I was at 18,100 and I had to descend along with all the other people who were trying to summit that day," she said. Days 20-24: Bad weather—rain at basecamp (snow camping in the rain FTW [for the win]) and high winds and snow up high. Bono said that ideally she would have had more time to train. "You have to train specifically for this type of climb," she said. "This year, I knew I was going to have a busy winter with no time to train, so it seemed like the time to do it.... I only trained four months for this. I would've done more but that was the time I had." Originally from Minneapolis, Minnesota, Bono devoted herself to competitive Nordic skiing from junior high through college at Dartmouth, a powerhouse for that sport. She continued her racing career with the Sun Valley Olympic Development Team and with Rossignol after college, through 2010-2011, but by then her focus on skiing started to wane. In the midst of all that Nordic racing, some friends had introduced the Junior Olympian to climbing and altered her trajectory. "I realized that maybe skiing wasn't for me when I started using all my rest days for climbing," she said. "That wasn't the way to excel at skiing." She became a climbing guide and moved to Canmore, Alberta, in 2012. She agreed that her Nordic skiing background gave her a good foundation for alpine climbing. "It gives you good fitness and you learn how to suffer for long periods in the cold," she said. Bono pretty much agreed about the toughness of competitive Nordic skiing. "Alpine climbing might be a little harder but definitely not rock climbing," she said, pointing out that rock climbing doesn't require a high level of energy to be sustained over a long period of time.